Don't just cut your documents, do it with style! The Fletcher F-60 Semi-Rigid Flexible Cutter features a dynamic plastic knife cartridge that provides a safe and secure usage. The F-60 is equipped with a .015" thick blade that has a cutting capacity of an amazing 62". The heavy-duty blade is able to cut and trim from semi-rigid materials to flexible substrates. Some of the products that can be cut are foam-board, PVC, corrugate plastics, cardboard, and mat board sizing to Canvas, vinyl, banner materials, laminated art, and digital prints. The F-60 cutting table is constructed from a 1.5mm premium sheet metal construction. The table displays a full table measuring graphic grid with built-in squaring arm, ensuring an accurate and perfect measurement. Incorporated with a lock down pressure clamp, documents will be permanently secured and provide a smooth and straight cut, anytime and every time. When trimming, editing, framing and customizing products, depth of cut is important. F-60 contains four measuring settings which will indicate the depth of cut, with the ability to cut up to 3mm thickness. Fletcher Substrate Cutter can be used as a table-top, or the option of a wall-mounted cutting. Sold separately, the wall-mount accessory kit will secure and provide a solid cutter on all flat walls. Fletcher F-60 Semi-Rigid Flexible Cutter is a vital tool for any in-house shop or offices that needs to cut a variety of materials. Sharpen your work station and productivity with the F-60 Cutter today. Features a unique plastic knife blade cartridge allowing quick and safe blade changes. Cutting head equipped with "Lock & Cut" feature - cutting head lowers and locks during cutting process. Lock down pressure clamp - securely holds material in place while cutting ridge substrates. Cutting head unit equipped with "Lock & Cut" feature - cutting head lowers and locks during cutting process. Utilizes a .015" thick blade providing exceptional cutting and edge quality with all paper based products as well as PVC materials up to 3mm thickness. Blade is permanently molded into a plastic jacket for safe handling. Allows for quick blade change. Contains four measuring settings indicating depth of cut. Semi-Rigid Materials - Foamboard (Up to 1/2 or 13mm), Corrugated Plastics (Up to 6mm), PVC (Up to 3 mm), Cardboard and Matboard Sizing. Flexible Substrates - Canvas & Vinyl, Banner Materials, Laminated Art/Photo Mounted on Foamboard, Digital Prints, and Photo Paper. Purchase Package: includes (3) Plastic Knife Blade Jackets. 1.5mm sheet metal table construction preventing warping of cutting table over time. Lock down pressure clamp - Improves cutting control and edge quality by securely holding material in place while cutting rigid substrates. Equipped with built-in squaring arm to securely hold the material for 90° cutting. Full table measuring graphic grid for straight line and angle cutting of 30°, 45°, 60° and 75° - includes spare part numbers for easy re-ordering reference. Easy to install on any wall. Requires wall foot print of: 74" (1.88M) x 44" (1.12m). Cutting head carriage can be field adjusted when used in the wall-mount set-up configuration - head remains stationary above material prior to cutting process. No loose hardware - contains all threaded inserts. Hanging weight: 45 lbs. (20.5 kg). Utilizes a .015" thick blade providing exceptional cutting and edge quality with all paper products as well as PVC materials up to 3mm thickness. Blade is permanently molded into a plastic cartridge for safe handling. Knife cartridge allows for quick blade change. Plastic cartridge contains four measuring settings indicating depth of cut. Full table measuring graphic grid for straight line and angle cutting of 30°, 45°, 60° and 75°- includes part numbers for easy re-ordering reference for spare and accessory items. Tends to move when cutting large foam board needs better non skid feet, other than that good product. Welcome to MyBinding video. Today we’re looking at the Fletcher F-60, a semi-rigid flexible cutter by Fletcher Terry. This doesn’t just cut your documents, it cuts them with style. You can place it anywhere in the workshop or the office on a flat table, clamp your documents down, and make your cuts. 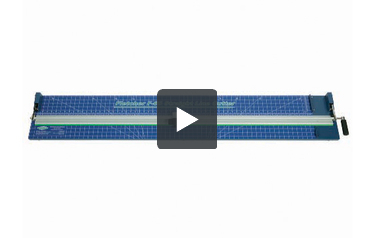 The heavy duty blade is able to cut and trim from semi-rigid materials to flexible substrates. It’s not just paper and cardstock but also foamboard, PVC, corrugated plastics, cardboards, and mat board sizing to canvas, vinyl, banner materials, laminated art, and digital prints. Everything clamps right in and squares up. A great measuring grid on the top keeps everything perfect the way you need it. The F-60 can be moved around, attached to a table, or even affixed to a wall with the optional wall mount. The blade locks up and down for cutting and for safety, and the pressure lock-down clamp puts the cutting control all in your hands. It has a premium sheet-metal construction and can trim up to three millimeters in thickness. And it can be used with the left or right hand with a push or a pull motion. Measured table length and cutting capacity is an amazing 62 inches long, so it’s perfect for posters, oversized projects, vinyl banner workings, and anything extra large. Your purchase comes with three knife blades. The blade is molded into the plastic jacket for safety and ease of handling. And with a simple turn of a screw, slide in and out the old and new blade and you’re on your way. The blade mechanism locks up and down; up for when you’re sliding it around and adjusting, and down for the cutting. The pressure lock-down clamp keeps your project in place with a series of various rubber grips There you have it, that’s the Fletcher F-60, a 62-inch semi-rigid flexible cutter. For more demos, reviews, and how-tos, check out MyBinding.com.